1. 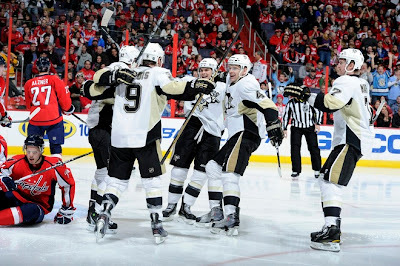 Great win for the Pens last night (would have preferred it happen in regulation), but when you can beat your rival on their ice in a dramatic shootout (especially considering that the rival has now lost nine of 11), you take it. And yes, I had a gut feeling something good was going to happen to Pascal Dupuis when he stepped up to the plate. Call it the 24/7 Effect. I think he's a good dude, and I'm glad it happened for him. 2. Meanwhile, Steelers-Panthers had about as much drama as we expected over at Heinz Field. Carolina had zero net yards and no first downs from the end of the first quarter until the final 90 seconds in the third, and as Ryan Clark said, "They're 2-13 for a reason". As I pointed out the other day, the Panthers have 13 players on injured reserve, nearly 1/4 of their roster. With the season already over in their eyes, they're using the remaining games to evaluate and keep their lofty 2011 draft spot. I'd say the evaluation part should be pretty easy: the players who have been suiting up stink out loud. But that draft spot's not going anywhere anytime soon. 3. It really made me happy to see Marc-Andre Fleury take over the shootout like he did last night. It seems like ages ago that Pittsburghers were clogging message boards and talk show lines saying that the mercurial goalie had to go. But like Dupuis, he's a very likable person that you want to pull for. He was a deserving recipient of First-Star honors last night and has won 14 of his past 15 games. Where have you gone, dear Fleury-bashers? 4. Ben Roethlisberger painted a Picasso against the Carolina D last night, nearly perfect on his pass attempts for a good portion of the first half. He finished with 320 yards, 1 TD pass, 1 TD run, and a QB rating of 111. Honestly, it looked like he was playing against guys two levels below him at times. 5. Speaking of elite athletes, how about King Crosby? The point streak stretches to 23 games, the longest since Mats Sundin's 30 games in '92-93, and he did it in grand fashion with the game's first goal. Crosby now has 60 points on 29 goals and 31 assists in 36 games, and like Roethlisberger, simply seems to be playing on a different level than the opposition. 6. Sticking with the impressive athletes theme, Mike Wallace continues to wow me. His 43-yard touchdown was of the jaw-dropping variety, contributing to a four-catch, 104-yard evening. And if you haven't noticed Emmanuel Sanders, you'd better start paying closer attention. Four catches, 54 yards, and the only "incompletion" in his direction was a touchdown that was overturned. He's well on his way to becoming an important player for the Steelers very soon, if he isn't already. 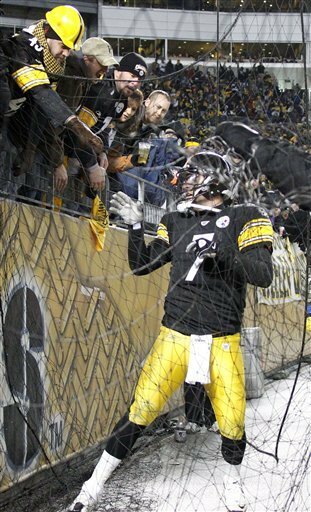 It was really nice having Heath Miller back in the lineup last night, and he responded with five grabs for 73 yards. I always appreciated Miller's presence, but as I wrote last week, I honestly feel like they beat the Jets if he's on the field. Hines Ward was targeted eight times but finished the night with only three catches. Last season, he had 95 catches for 1167 yards and 6 TDs. This season, he's on pace for 58-757-4. Your eyes aren't deceiving you. There's a lot of wear on those tires. That being said, he still has some gas in the tank if the NFL is playing football in 2011. 7. I referenced 24/7 earlier in this post, but I'm really interested to see their portrayal of this Pens/Caps game from both teams' vantage points. Anyone care to take an over/under on Bruce Boudreau F-bombs? And speaking of TV broadcasts, I love Primanti's as much as anyone, but can networks broadcasting a game in Pittsburgh ever give any love to any other of the fine eating establishments in the city? We eat more than cole slaw-and-french fry-packed sandwiches, you know. But watching games on the NFL Network...or NBC Football Night in America...or Fox...or CBS...that's about the extent of our diet. I've said it before, and I'll say it again: this needs to change. 8. Looking ahead for the Steelers, the regular season comes to an end next week at Browns Stadium against reeling Cleveland, who gets to finish with Baltimore this week and Pittsburgh next. The scrappy Browns are 5-9 and coming off losses to Cincinnati and Buffalo, virtually killing their chances of going 7-7 entering Peter King's Fine Fifteen in the process. They have the look of a team that might be giving up the fight after a year of really getting the most out of the talent they had. They should make a perfect opponent for the season-ender, regardless of how playoff implications shape things between now and then. 9. For the 24-10-2 Pens, next is a roadie at Ottawa (15-17-4) on Sunday. Alexei Kovalev, Jarkko Ruutu, Sergei Gonchar...the Sens are a virtual collection of former Penguins not far away from playing in the next Alumni Game. The record doesn't surprise me. This week's award takes advantage of our unique double-recap and ventures into the world of hockey, for a candidate very worthy of such an honor/mocking. He is beloved by his fans and by network execs, yet he always seems to come up short in crunchtime. If he had an NFL equivalent for his gaudy stats and lack of appearances in a championship setting to go along with his "unique" personality...Philip Rivers? But there's no point in beating around this bush. We all know who takes the title. For no regulation goals in eight straight games and another loss to the Penguins, give up that Sad, Sad Trombone to Alex Ovechkin. He's earned it. Where are all the negative jerks saying we cant win without Polamalu? The defense isnt making any big plays wah wah, well our offense scored over 20 points and we didnt have to worry about that. I dont think people realize how bad these teams are. It was a nice jump start for our offense who couldve had even more points, hopefully we keep things rolling in Cleveland, because we definitely have to score more than 20, maybe even more than 27 to beat New England. I appreciate the parallels drawn between Dupuis and Fleury, but being likeable guys is where it ends. Fleury is a great starting goalie who can win us another stanley cup. Dupuis does not have the talent to be a top line player, anywhere in the league. We just dont have anyone better right now. I don't hate Dupuis, i think he makes the most for what he has, he is just a 3rd or 4th liner, and always has been, and it annoys me that he usually can't finish. I think you could put a monkey in Dupuis place next to Sid, and we'd still be winning. I really hope the next 24/7 shows Geno practicing penalty shots. For hours. "Where have you gone, dear Fleury-bashers?" Still here. A good defense, Sidney Crosby and Evgeni Malkin can get you wins as a goalie, but you can't hide his sub-par save percentage. Still only .907 for his career. Go high on him and score automatically. Not saying he's garbage, but he's an average NHL goalie. He's not as bad as people made him out to be, but he's not NEARLY as good as his supporters make him out the be either. Doesn't belong in the discussion of great NHL goalies. As far as Fleury, I agree that he may not be as good as some of his supporters would have you believe, and that is save % is not amongst the elite in the league, but the kid has been to two Finals already, won a Cup, and has been a big part of this latest run of success for the Pens......his biggest issue is inconsistency, and there is plenty of time to evaluate where he will finish in terms of goaltenders....as far as good defense, their Cup run showed good defense, and the team D this season BECAME very solid, but he has not played behind defensive juggernauts for the most part. @ Nate - yeah, but he sure makes a lot of big saves in clutch situations! And playoff records don't lie... just ask carson palmer! @ jerrykid - i have to agree with makoman. He's a very valuable wingmate/teammate for the kid. Sure, you're right too, compare him vs anyone else in the league in a lineup without sid and duper is prob in the basement. However, for what he costs and what they ask/need him to do, he does so very well. The question for Fleury shouldn't be "is he solid?" It shouldn't be "is he good, even if he is inconsistent?" People like to forget that he was the first overall pick. Expectations for him should be much higher. If we go him later in the draft, that's one thing. But where we got him, he's not elite even though he SHOULD be. He SHOULD be in the conversation about goalies like Brodeur, Backstrom, Luongo, Thomas, etc. But he's not. In fact, among active NHL goalies his career save percentage ranks 18th. That's a big problem for a first overall pick.